The alignment of marketing and sales is really about the customer. We have to look at everything we do through the eyes of the customer. Most organizations still believe in the perfect sales and marketing delineation: This is where marketing generates leads for sales, and then sales development reps qualify these leads to create opportunities that salespeople hopefully turn into revenue. One of the most important factors in creating a scalable, repeatable revenue machine is sales and marketing alignment. In aligned organizations, sales and marketing are working together in a coordinated effort to achieve the ultimate goal: revenue. Quite simply, that’s not how it works in sales today. Why? Because the buyer has changed more in the past 10 years than in the past 100, the buyer is in control. The modern buyer is digitally driven, socially connected, mobile, and empowered, with nearly unlimited access to information and people. The new reality is that sales and marketing are continuously and increasingly integrated. Marketing needs to know more about sales, sales needs to know more about marketing, and we all need to know more about our CUSTOMERS. Social networks like LinkedIn and Twitter give sales professionals insight into three key things about the buyer: identity, relationships, and interests. 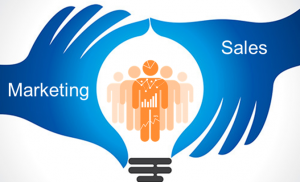 Marketing and sales need to work together to equip sales with what is becoming a mainstream competency: social selling. Salespeople are being replaced by search engines and social networks. With professional, buy-centric social profiles and content, marketing can help sales be visible and relevant to the modern buyer. Your sales organizations will not magically acquire the new skills required to use social media as part of their selling process on their own. You have to create standardized guidelines and enablement programs that include in-depth training that not only focuses on the value of engaging in social selling, but also stresses best practices and immediate, practical advice to get started quickly. We’re living in the age of the customer, no longer the age of the seller. The required mindset is one of HELPING, not SELLING. Marketing and sales need to align to, with, for, and around the customer. The organizational culture needs to be customer-centric obsessed. Next step is for organizations to finally execute on this vision. To start, sales and marketing must first agree to work together to align. Then sales and marketing leaders need to agree on a number of key elements that will allow them to avoid the chasm of the past and begin to create their revenue machine. Please join us in TieCon 2019 @ our Marketing & Sales Alignment Track on Friday, May 10th from 11:00 AM where CMOs from Zendesk, Atlassian, and SalesLoft discuss this exciting topic live!